It's officially cold and flu season, and with my husband just getting over a cold. 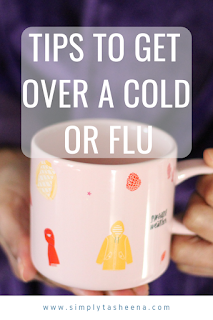 I thought it was the perfect timing to share with you Tips to Get Over of a Cold or Flu. Last year was the deadliest flu season in 40 years. Though no one want's to have a cold or flu. It's so important to take necessary precautions when administering and taking medications. 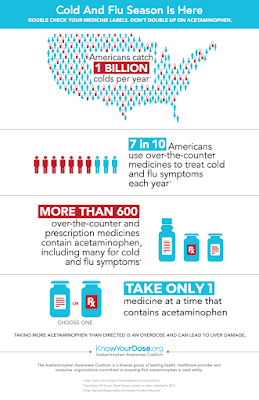 The Acetaminophen Awareness Coalition (AAC) is urging Americans to double-check their medicine labels when treating for cold and flu symptoms to avoid doubling up on common medications like acetaminophen. 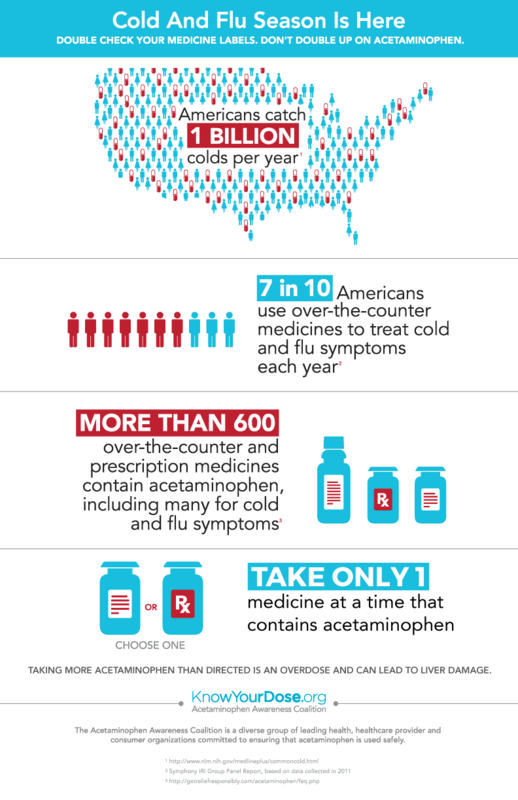 Studies published last year shows that the odds of Americans taking more than the FDA-recommended maximum dose of 4,000 milligrams (mg) of acetaminophen in one day increased 24 percent during cold and flu season. This is primarily due because more people using over-the-counter (OTC) combination medications to treat upper respiratory cold and flu symptoms. If your shopping at your local pharmacy and consult with the pharmacist there. Have them research the prescriptions in which your taking whether you're suffering from a common cold or feel as if you have a fever. Ask to see which over-the-counter medicine would be the perfect match for you. For instance, if you Chronic pain and are prescribed medication, you want to make sure that the medications you're taking can be taken with the over the counter medication. 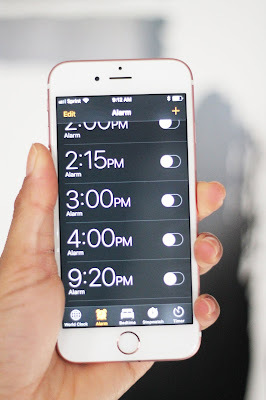 While my husband was sick, I had all of his medications timed on my phone. If you have a smartphone is only takes a couple of seconds to arrange. This ensured that there wasn't any overlapping with medications. Though Acetaminophen is safe and effective in treating fever and pain. 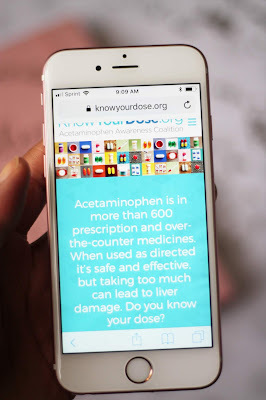 It's only effective when used as directed; however, taking more acetaminophen than directed can lead to liver damage. It's so important to read the medicine label prior to consuming any medications. Whether they're over the counter or prescribed. Take a moment to read, and compare what you have at home and what you're purchasing. Make sure that you double check your medicine labels so you don’t accidentally double up on acetaminophen. Products and medications change on a daily basis. Never awesome, double check any medications your taking. 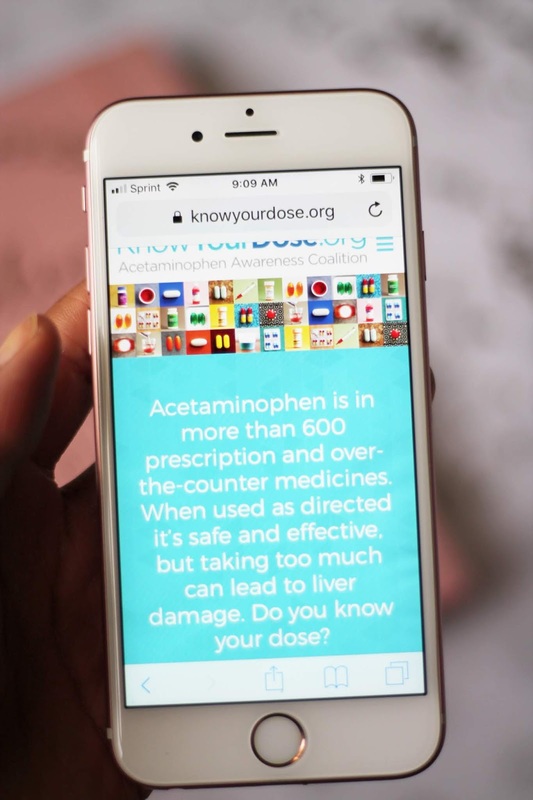 To learn more, and for additional information check out Know Your Dose.org and for parents with infants and small children they have additional information here. Ugh - perfect timing. My oldest son is sick and I have been making him drink so many fluids to keep him hydrated these past few days. Yes all of these things are important. Just getting a good nights sleep does wonders for maintaining or getting over and illness and keeping a healthy body. You might want to look at the title and take out the of. Oh man, it's never fun to be sick. We always get colds. I am hoping we skip the flu though. We did last year. *Knocks on wood* Thank you for these tips! 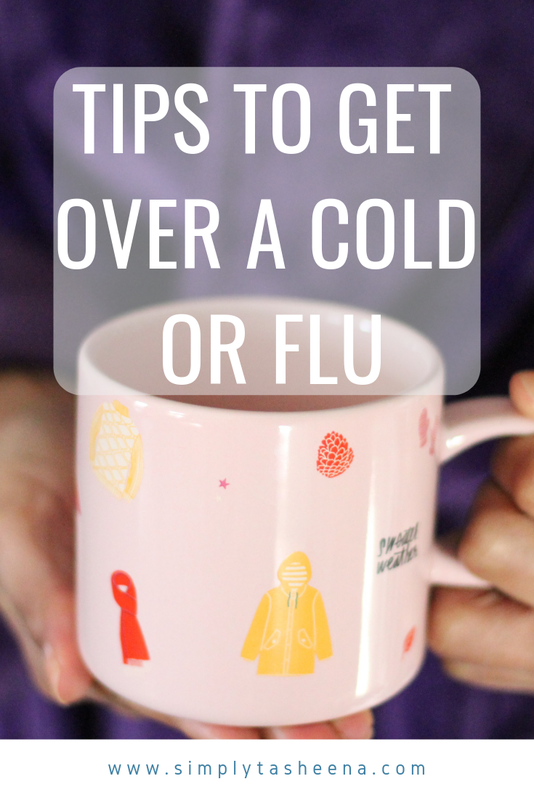 I will be bookmarking these tips because I am sure sometime this Winter one of us will end up with the Flu. As my son may bring it home from school or hubby from work. With it being at the top of flu season these are some very good tips. Whenever I have the flu all I ever wanna do is sleep. So I have that one down in spades. I do not want to eat so that is definitely something I need to work on. Rest and fluids are two tips that I always follow! It really does take time to get over a cold or a flu. Thanks for sharing these! Above all wash your hands. We make sure to teach our kids to wash their hands and cover their nose and mouth when they sneeze or cough. 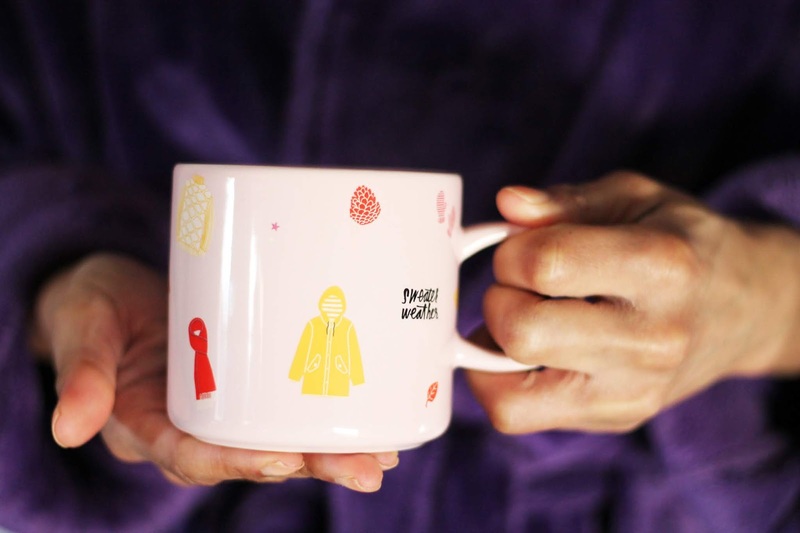 These are the best tips to get over the cold or flu. I'm glad you shared them, super helpful this time of year. These are the best for this time and year. W need to get this out to everyone. This cold and flu season has been really rough. I bet a lot of people need these tips! This is such an important reminder! Even though I think of acetaminophen as a very safe drug, it is important to not take too much at a time. I need to check every time if my over the counter sinus medication has acetaminophen, especially because I don't always buy the same kind. While I hope that the cold/flu bug stays far away from our house this year, I am going to bookmark this... just in case! A nice steamy shower is a game changer for me in the mornings when I have a cold. If I can swing it I go for one at night too. These tips are perfect for this flu season. I love the idea of scheduling the medication time on the phone. Never thought about it! 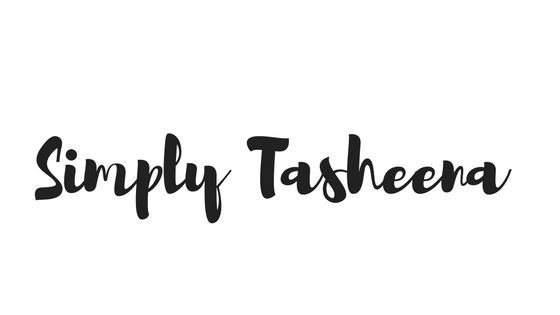 I don't normally read labels but when it comes to food and medicine, I make sure to read it. Great tips. Thanks for the tips! The flu is definitely going around and I bet they'd come in real handy right now. The washing your hands tip is the best! I also am a big believer of zinc. Knock on wood, we've been fortunate this season so far. I do prep ahead and have a well stocked medicine cabinet so I'm ready when it does hit. During this time of year cold or flu is so common, love all your tips. I have all ready have essential medications in hand. For curing Cold and Flu, hydration is must. Take water and other fluids like Coconut water, bouillon soup, etc in a regular interval. That will help your body to recover. Also, vitamin C can boost your immune system. If possible take an IV Therapy to cure Cold/Flu. It's the fastest way to recover Cold and Flu. Thanks for sharing this post, really helpful. Keep it up!